236 YEARS - OOOOORA !!!! The pictures below are of Peiping & Tientsin also known now as Tianjin, our trip to the Great Wall, and some of our buddies we served with, ( some of which I still keep in touch with.) Fred Van Almsick - Blacklick, Ohio - Richard C. Larson - Ueiling, Nebraska - George "Jobby" Hart - Bloomington, Indiana. A Co. 1st Eng Bn. 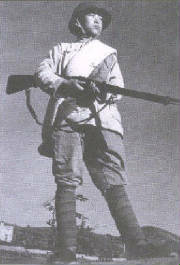 's duty was to disarm and repatriate the Japanese forces in North China, pull guard duty at our compound (British Legation,) build a rifle range on the outskirts of Peiping, run train guard from Peiping to Tsingtao, and other areas of North China. I say Peiping, that's what we called it then. "The Walled City." It's Beijing now. 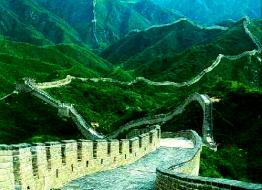 Stretching 1,550 miles (2,500 kms) from the eastern Shanhaiguan Pass to the Jiayuguan Pass in the Gobi Desert, the Great Wall is one of the few man-made constructions that can be seen from space. with the 4th Marines (Reinforced) attached. 18 June 1946 until June 1947. Pictured below, two ships,Top: The USNS Starlight AP-175. On this ship we enbarked for China from San Pedro, Calif. January 1946 and landed at Taku Bar 9, Feb 1946. A lot of sick Marines after about the first night out. It was the first troopship for most of us. Bottom: We arrived back to San Diego on board the USNS Oneida APA-221, Aug 29th 1946. Pictured below: Summer Palace - Peiping, June 1946. 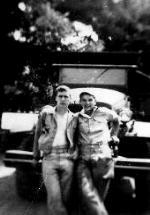 Bob Kline, standing and Lewis Ceccarelli. China Duty, "The Best." I remember we all had a nine course duck dinner at one restaurant that day, with wine or Chineese beer (not so hot), and the bill was around twenty-seven cents each. Pictured below: Fred Van Almsick in rickshaw. You could get one, and be taken anywhere in Peiping for about 5 cents a day. Fred lives in Blacklick, Ohio. He retired a few years ago from Ohio Bell. Pictured below: Tientsin, China - Jerry & I standing at gate of compound with Marine sentry and friend. (February '46.) Note: Sword, taken from Japanese soldier. Our barracks there were huge old warehouses. Pictured below: Jerry and I setting on the Great Wall. June 1946. (Note Mongolia in background.) Rode donkey's from train to the Wall. 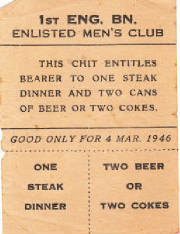 The chit below was usually passed out at the enlisted mens club (slop-shoot) about once every 2-3 weeks. The steak and beer was excellent. Pictured below: On Donkeys here on our way up to the wall from the train station. Twenty-five cents. 1946. Below: This was the Ist Eng. pass we were all issued to get into the "Slopshoot" at our compound in Tientsin, China. Slopshoot, Jarhead jargon for bar. Ten cent Pabts Blue Ribbon and Duquesne beer. Hard stuff a few cents more. Pretzels, beer nuts and sandwiches. And last but not least, a great Juke box. An article from it is below on this page. (Taken from an article in The North China Marine.) August 3, 1946. Tientsin,China. Marine Column Ambushed. Marines Strike Back In Fierce Fight On Peiping Highway. By Capt. Thomas A. Watson, USMCR. Tientsin, Aug, 2- At 1205 Monday, July 29, a motorized patrol of the First Marine Division (Reinforced) escorting a supply convoy from Tientsin to Peiping was ambushed by an estimated 300 uniformed Chinese at the village of Ta Hsiao San Ho about 35 miles South east of Peiping. In the ensuing battle, which lasted four hours, one officer and two enlisted Marines were killed, four enlisted seriously wounded and eight enlisted less seriously wounded. Also hospitalized are an officer and one enlisted with injuries resulting from motor accidents which were incidental to the attack. Estimated Chinese casualties were 12 dead and an unknown number wounded. The section of the road where the attack occured is eminently suitable for an ambush. The road is raised between deep ditches with tall corn growing right to the edge of the deep cuts on both sides of the highway. There is a clump of trees on the west side of the road with a small, walled compound just opposite. The village of Ta Hsiao San Ho is about 500 yards from the highway. The attakers had arranged a road block of two wheelless ox carts between the trees and the wall of the compound. A machine gun was emplaced at the south corner of the compound covering the road perfectly. When the point of the patrol reached the road block, the attack began without warning. A potato-masher type grenade was thrown just as the patrol leader dismounted from his jeep, killing him instantly. Immediately 11 other grenades were thrown at all vehicles in the point. At the same time rifle fire supported by one automatic weapon opened from the tree clump. As the main body of the patrol and the convoy rolled to a stop, accurate, heavy rifle fire was received from another clump of trees about 300 yards to the right of the road and from both right and left rear. 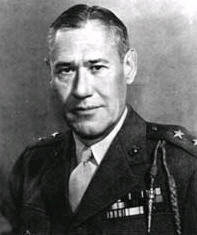 Platoon Sergeant Cecil J. Flanagan assumed command of the main body and organized his defense in the ditch along the road. The shattered point was completely cut off by fire across an open space in the road where no ditches existed. While a get away jeep raced for help at Tientsin, he directed the return fire of the Marines until action was broken off at 1600. An Army officer traveling with the group materially assisted in placing the patrol's mortars and heavy machine guns and diricting their fire. About 1600 a bugle was sounded at the Chinese command post which was located in the tree clump to the right of the road. Fire from all Chinese positions was intensified for a period of about two minutes and then ceased. A white flag was raised on the compound wall. Accompanied by two interpreters, a Navy corpsman started forward but was shot in the leg. This was the last round of the engagement. The wounded were tended and the patrol mounted up and proceeded to Peiping. Most of the casualties were suffered by the point in the initial grenade barrage. Only two men were wounded by rifle fire. The attackers were well organized, the ambush perfectly prepared and the attack without warning was vigorous and aggresive. They wore blue-gray and tan uniforms and some were dressed in peasant clothes. The efficiency of the Marine defense is attested to by the fact that only two casualties were received after the surprise attack by grenades. The only vehicles left behind by the patrol were damaged trucks which could not be started. The jeep dispatched to Tientsin for help overturned; the occupants then had to hitch hike to Tientsin via a Chinese vehicle, and time was lost before word of the attack could be delivered to Marine Headquarters. A heavily armed patrol with combat air support and light observation planes was sent out as soon as it could be organized. This force searched the area where the fight took place but found none of the attackers. 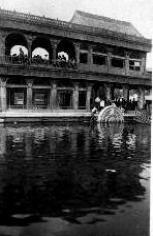 It repaired the vehicles, recovered bodies of Marine dead and went on through to Peiping. The patrol returned the next day and air search began at dawn but only revealed a peaceful village and a few truck tracks on the shoulder of the road. The Chinese bodies, in their gray uniforms, wrap-around leggings and soft shoes were the only evidence of the violent and dastardly attack. Patrols of this type travel the Tientsin-Peiping highway every third day for the purpose of inspecting the roadway and as protection for supply convoys for Marine forces at Peiping and U.S. Army Executive Headquarters. Communications are maintained by radio jeeps with Tientsin and Peiping through relays set up just outside of each city. Regular ten-minute reports were received from the patrol until 1130 when atmospheric conditions caused a failure After the attack started it was impossible to man the radio jeeps. 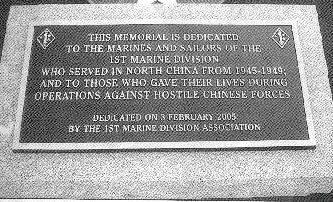 China Marine Memorial dedicated by the 1st Marine Division Association at Camp Pendleton. 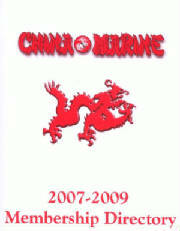 Below: The China Marine Directory for 2007-2009. It has the names of all the members of the CMA, home addresses and where each served in North China.